Friends who helped in NYC in the wake of 9/11 began wearing their shrouds today. 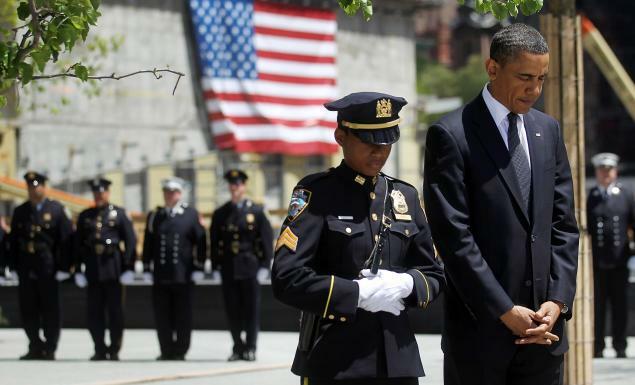 NYPD officer Stephanie Moses, who had literally become “the face of NYPD” after last year’s wreath-laying ceremony at Ground Zero following the death of Osama bin Laden, committed suicide in her home yesterday. The 17-year veteran of the force was 40 years old. She shared her home with her lesbian partner, Melissa McCoy, a retired NYPD detective. While there has been some speculation about her reasons I will not post them here. Speculation is meaningless to me. Being in public safety myself, three of those I have worked with, trained with and deeply respected have committed suicide. Having seen many suicide scenes while on duty myself I often ask not to be told how they chose to leave this life; I don’t want to picture what they probably looked like. In every case I’ve heard the speculation on why they did it – financial hardship, relationship woes, things on the job just got to them. I have watched more police officers, firefighters and medics kill themselves than anyone else in any other profession I’ve been involved in. Every single time I’ve been taken completely by surprise. All three of them had young children. Four others that I knew professionally but didn’t know personally well have also committed suicide. Every time it happens I wonder what is being done. In our world, there is never any warning – we all know what will happen if we do tell someone. There will be reports involved. People we know may end up coming to our home and seeing us in that dark place that we never want to admit we’re in. We may be required to check in to a hospital and begin taking medications that will drastically alter our lives. There’s often a deeper stigma involved where people you’ve worked with and trusted with your life suddenly keep their distance if they know. On the few occasions when one of us has sought help, it has ended up hurting more in the end. And still those in command wonder why we don’t reach out. I wish more than anything that it weren’t like this. My heart breaks for Officer Moses’ partner, family and fellow officers. I know that feeling all too well – how did this happen? How did things get so bad that this was the only way out for her? What could I have done? You will never stop asking those questions. I wish I could say that you may someday have the answers you seek, but you won’t. I will pray that God gives you peace even though you never understand they whys or wherefores. To those I know – and those I don’t – who are in public safety, I offer an admonition: please, even if you don’t reach out to another officer or firefighter, reach out to someone. Take care of yourselves. Don’t let the darkness win. To Officer Moses…rest in peace. You will be missed.